Follow-up with BCWood on September Global Buyers Mission attendees interest areas. Attend the 4th Global Timber and Wood Products Trade Conference in Qingdao. (Co-hosted by Wood markets and China Timber and Wood products Distribution Association (CTWPDA). 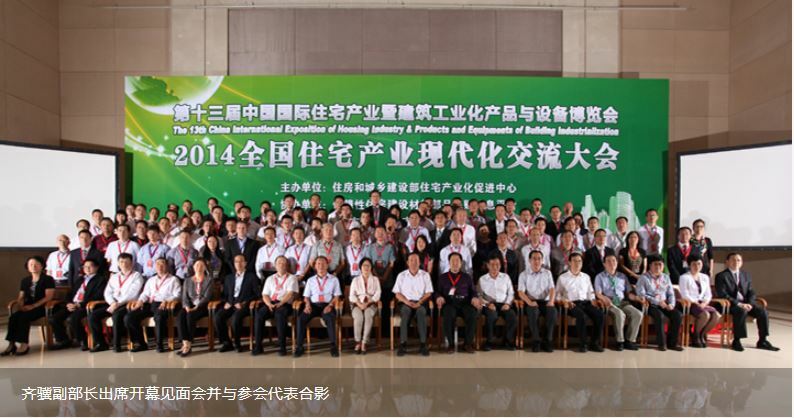 The CTWPDA invited us to participate at the grading seminars we presented in China in June 2014. The conference was attended. Over 300 wood manufacturers, distributors and buyers attended. The conference was jointly hosted by Russ Taylor Wood markets and the CTWPDA (China Timber and Wood Purchasing and Distribution Association). There was a notable lack of Canada Wood presence in comparison to several other countries with similar branding and promotion programs including Sweden, Finland, Germany, United States, New Zealand, India and Malaysia. 3) Evaluate the Qingdao market opportunities as well as the port and wood manufacturing areas. An assessment is presented below. 4) Attend the 13th Chinese International Housing Industry Exhibition in Beijing. AFPA and BCWood had a joint booth at the exhibition. Completed. A contact list of booth visitors is available. 5) Meet with Canada and Alberta Trade office personnel based in Beijing. Completed. Develop more detailed profiles and contact information for short listed Alberta mills interested in expanding business in Asia. Since most Alberta mills are dedicated to the North American Market, they will be excluded from the profiles. Appropriate sales and marketing contacts will be provided for each mill whether it is direct or through appropriate brokers. Completed and will be used in upcoming China tradeshows such as Interzum in Guangzhou March 2105. The Beijing Exhibition is an important event for contacting wood buyers as well as villa wood frame construction companies. Canada Wood Group plans to continue support for this event. The next show is scheduled for September 9-11, 2015 which appears to conflict with the BCWood Global Buyers Mission. An alternate show in Northern China will be selected as alternate for 2015. Canada Wood and/or Alberta Forest Products Association on behalf of Canada Wood, may want to consider attending the 5th Global Timber and Wood Products. The next conference is on September 15 and 16 2015 in Shanghai. About 300 delegates attended the conference, representing all of China’s associations and wood manufacturing and distribution associations as well as 25 wood exporting countries. See Appendix A for Summary of speakers and list of Conference attendees. Key messages heard at the conference. Cooling down of China Economy. The new normal 7.5% GDP growth. New national committee will focus on anti-corruption, excessive land price speculation and put controls on regional government debt loads. This means a cooling off in commodity demands by China. Canadian lumber and log inventories have been excessive through 2014 but have fallen back to normal going into Chinese New Year. Chinese buyers are finding Canadian lumber is too expensive in relation to market demands. Canadian lumber prices in China have softened in relation to those offered in the US market as the Canadian currency has weakened against Chinese Yuan which will improve affordability if buyers do not do transactions based on the US dollar. Buyers are suggesting that the quality of lumber economy grade sourced from Western Canada is deteriorating and is more expensive versus quality. They are turning to Alberta 2 and better sourced lumber where appearance and better recovery desired. The extra transportation cost to tidewater from Alberta continues to be a challenge but quality wins out of over extra marginal costs. Europe and Scandinavia are flooding the market with cheap and very good quality lumber. Chinese companies are buying wood supply and land in New Zealand. Russian lumber and logs are becoming affordable again with the severe devaluation in the Ruble. Russian domestic prices have increased 30% to stay in step with currency devaluation. The Far East area in Russia are offering major inducements to attract Chinese capital and investment. Cheaper Russian wood has somewhat displaced Canadian SPF lumber in northern port areas (Tianjin and Dalian) but Canadian SPF is holding its own in southern China, especially in Shanghai and Guangzhou. The market for Canadian SPF showed modest gains for 2014. European and New Zealand suppliers have been matching Russian prices so far but they feel they have reached there limit for discounts. Russ Taylor is suggesting that SPF logs and lumber will peak in 2016 and start significant declines as annual allowable cuts start declining in BC, Ontario and Quebec. Wood Markets forecasts that SPF lumber imports into China will decline about 5% in 2015 and then a similar percentage again in 2016 from 2014 level of 3.35 billion FBM. China’s economy showed further signs of softening in July despite a burst of government stimulus measures, suggesting more policy support may be needed to keep growth on track as a property downturn worsens. Unexpectedly weak growth in investment, retail sales and bank lending in July all pointed to growing vulnerabilities in the world’s second-largest economy. The biggest surprise from mid-August’s data deluge came from credit and financing figures that showed the amount of cash flowing into the world’s second-largest economy tumbled to a near six-year low in July of 273.1 billion Yuan ($44.34 billion), about one seventh of that in June. The central bank downplayed the drop; saying that the plunge in lending was a natural pullback after an unusual surge in June, while conceding loan demand was slowing. Analysts said the unusually large drop might also have come on the back of a crackdown on high-risk loans and commodity financing in the wake of a fraud scandal at the port of Qingdao. But the dour news rattled some economists, who worried that the numbers signaled not only weaker loan demand in the property sector but growing caution on the part of banks to lend in general as credit risks increase. The mood contrasted sharply with that in June, when data showed the economy appeared to be regaining traction after a weak start to the year. “The reading on investment, the most important driver of the economy, missed market expectations again,” said Hu Yuexiao, an analyst at Shanghai Securities. Hu said he expected authorities to further loosen monetary policy with a possible interest rate cut, whilst trying to stoke investment growth by slashing red tape and wooing private capital. Helped by a steady stream of government stimulus, China’s economy rebounded slightly to 7.5 percent in the second quarter – in line with the government’s full-year target – from an 18-month low of 7.4 percent in the first three months. But buffeted by a property downturn that has hurt domestic spending, the economy appears to be sputtering again. Questions about the durability of the economic recovery flared last week when surveys on the services sector showed unexpected weakness, linked largely to the housing market downturn. A Reuters poll last month showed analysts were split on whether China would cut the reserve requirement ratio this year, though half of those surveyed thought that a 50-basis-point reduction was possible before March. Analysts who oppose further policy loosening, including the International Monetary Fund, argue that China’s economy is already awash in credit, and authorities must refrain from adding more cash to the system unless growth crumbles. Industrial output rose 9 percent in July from a year earlier, the National Bureau of Statistics said, slowing from June’s 9.2 percent gain but in line with market expectations. Data showed exports grew nearly twice as much as expected, though imports unexpectedly fell, pointing to soft domestic demand. Retail sales, a key gauge of domestic consumption, rose 12.2 percent in July from a year earlier, slowing from June’s 12.4 percent pace. “The activity figures are basically lower than market expectations, especially the investment data, which is mainly due to the weak showing in the property market,” said Zhou Hao, an economist at ANZ in Shanghai. Accounting for roughly 15 percent of China’s economy, the housing sector has faltered this year as prices and sales turned south, leading many analysts to warn that it poses the biggest risk to broader growth. The data released in mid-August showed the slowdown may have deepened. Housing sales skidded 16.3 percent in July compared with a year ago in terms of floor space, Reuters calculations showed, a sharp increase from June’s 0.2 annual fall. New construction fell 12.8 percent in January-July as cash-strapped developers tried to clear huge inventories of unsold homes. But discounts and other sweeteners have failed to attract many buyers, who expect further price declines. While easier access to loans is seen as one key to preventing a sharp correction in the property market, a survey released by Standard Chartered last week indicated many developers were finding it tougher to access funding through banks or trust loans. They also said borrowing costs were rising, and most felt banks did not appear more willing to extend loans to first-time home buyers despite encouragement from the central bank. Analysts said the wobbly real estate market had dampened overall investment growth, which was up 17 percent in the first seven months compared with the year-ago period, a level unseen in over 12 years. Economists disagree on whether China will need to resort to more aggressive policy loosening measures, such as cutting interest rates or the reserve requirement ratio for banks to shore up growth. A Reuters poll last month showed analysts were split on whether China would cut the reserve requirement ratio this year (they did in January 2015), though half of those surveyed thought that a 50-basis-point reduction was possible before March. 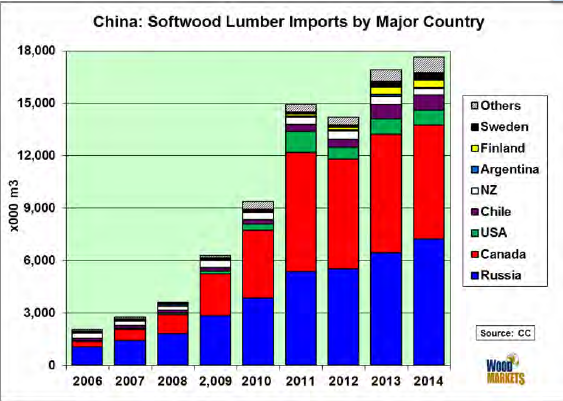 BC softwood lumber export volume to China to the end of June 2014 was 3.67 million cubic meters as compared to 3.52 million cubic meters over the same period in 2013, an increase of 4.1%. BC softwood lumber export value over this same period was $674.92 million, a 6.1% increase. Alberta shipments are estimated to be about 10 percent of the total SPF shipped to Asia. Qingdao is a major city in eastern Shandong Province. Qingdao has jurisdiction over seven districts and five county-level cities. According to the 2010 census, the built-up (or metro) area made up of 6 urban districts and Jimo City had 5,764,384 inhabitants, while the total population of the sub-provincial city is up to 8.71 million. Lying across the Shandong Peninsula and looking out to the Yellow Sea, it borders Yantai to the northeast, Weifang to the west and Rizhao to the southwest. Qingdao is a major seaport, naval base, and industrial centre. The world’s longest sea bridge, the Jiaozhou Bay Bridge, links the main urban area of Qingdao with Huangdao district, straddling the Jiaozhou Bay sea areas. It is also the site of the Tsingtao Brewery, the second largest brewery in China. Living standards are among the highest of leading Chinese cities due to the strong export economy and relatively high family wages. 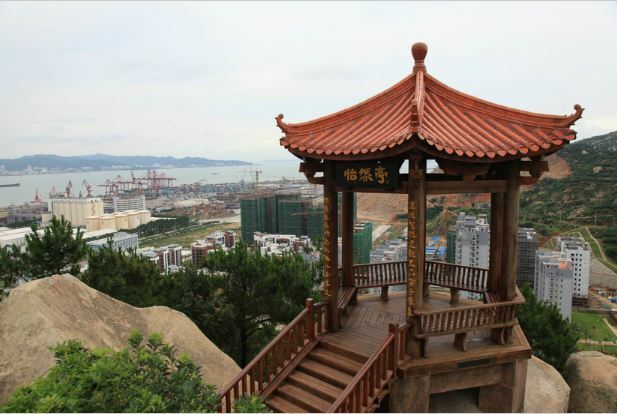 Qingdao is home to 38 Chinese ethnic minorities, which account for 0.14% of the city’s total population. An important region in Eastern China, Shandong Province has seen substantial change in its economic landscape in recent years. Much of this development has been concentrated in Qingdao. Qingdao has seen rapid development. With an annual growth rate of 18.9 percent in 2006, the city’s GDP reached 42.3 billion, ranking first in Shandong Province and tenth out of China’s top 20 cities. GDP per capita comprised RMB¥52,895 (US$7,616) in 2008. The GDP has grown steadily at an average pace of 16% annually. In 2006, Qingdao was ranked one of six “golden cities” by the World Bank, out of 120 Chinese cities assessed on factors including investment climate and government effectiveness. The Port of Qingdao is a seaport on the Yellow Sea in the vicinity of Qingdao, Shandong Province, People’s Republic of China. It is one of the ten busiest ports in the world (7th in 2010 considering total cargo volume according to the Institute of Shipping Economics & Logistics). Beside including the Qingdao Qianwan Container Terminal and the Qingdao Cosport International Container Terminal, located in different areas, Qingdao also has a large terminal for handling iron ore.
Qingdao Qianwan Container Terminal is a port of China, located at Qianwan (literally The Front Bay), Qingdao, Shandong province. Qingdao Port ranked 10th in 2008 world’s busiest container ports with 10,320 thousands TEU, current projects were expected to raise the capacity to 15,000 thousands or more. Phase 2 & 3 were held by Qingdao Qianwan Container Terminal Co.,Ltd (QQCT), a joint venture of Qingdao Port (Group) Co. Ltd. (31%), Dubai Ports World (was held by P&O) (29%), COSCO Pacific (20% interests, 18.18% voting power) and A. P. Moller-Maersk Group (20%). Phase 2 and 3 had 11 berths. Phase 4, as Qingdao New Qianwan Terminal (QQCTN), located in south bank, was a joint venture of Qingdao Qianwan Container Terminal Co.,Ltd, (80% interests) and Pan Asia International Shipping Ltd.(20% interests), which started to build in 2007. In 2009, the first 4 out of 10 berths started to operate. Co-currently, China Merchants Holdings (International) reached an agreement with Qingdao Qianwan International Logistic Park to build a port for the Logistic Park in September 2003.,[ which had 5 berths dedicated for container (which CMHI holds 100% interests) and 2 multi-purpose berths. The whole project CMHI holds 90.1% interests. The project started the construction in 2005. In December 2009, China Merchants International Container Terminal (Qingdao) Co.,Ltd., the wholly subsidiary of CMHI, reached an agreement with QQCTN to set up a new joint venture company Qingdao Qianwan United Container Terminal Co., Ltd., (QQCTU) to engaged in the construction, operation and management current and future projects in the south bank, and take-over the current berths of China Merchants (5 berths) and QQCTN (4 berths). BCWood organize the Canadian Pavilion that included QWeb and one of their member (Modulex Homes) joined Viceroy homes and Big Foot log homes (BCWood members). The AFPA shared a booth with BCWood. 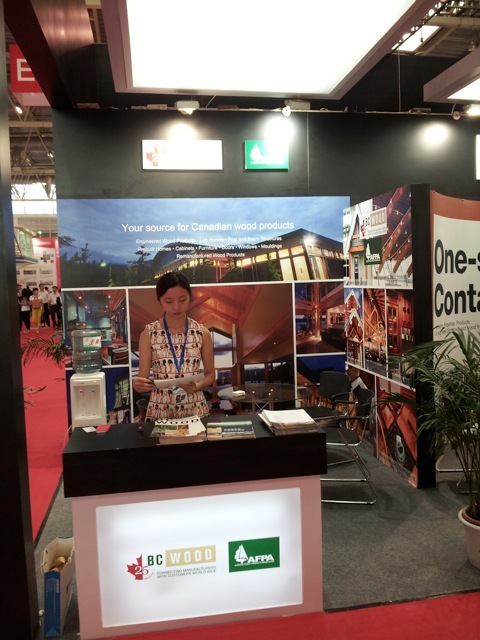 Canada Wood organized a seminar: Wooden construction development and innovation China seminar in the afternoon of Sep. 17, which is the second day of the show, and invited about 60 customers into the seminar.